That night I awoke suddenly. The numbers on the clock beside my bed said 12:16. It felt cold in my room. Intending to walk across the room to check the window, I groggily swung my feet over the side of the bed. It was like sticking my legs into a tank of ice water. Instantly wide awake, I looked beside my bed. The dog ghost stared back at me. The cold air that swirled around my feet came from her. The dog ghost did not appear menacing. Instead she trotted to my bedroom door, which was closed. She turned back, as if to say, Let's go. When Rusty notices a thin, dispirited German shepherd chained without food or water outside a dilapidated house in freezing rain, he feels called to try to do something for the dog. Despite his harried mom's warning to mind his own business, he buys dog chow and stealthily feeds the dog after school every day. As the weather worsens, he even secretly places a call to the county humane officer, who reminds him that he must have five days' photographic proof that the dog is being neglected before she can make an inquiry. Rusty begins to take snapshots of the dog every day, and when his best friend Andrew questions where he hurries off to every afternoon, he even enlists him in the mission. At first he is afraid to tell Andrew about the ghost dog he sees lying with the German shepherd, a misty white collie who vanishes when anyone else approaches. But when the ghost dog summons him to the house late at night to find what he is beginning to think of as "his" dog obviously injured, he and Andrew decide that the dog can't wait for the county to take action. They take the dog to their treehouse hideout in the woods near Rusty's house to keep him safe from his cruel owner's beatings. But still the ghost dog comes for Rusty at night, and following her to the house, Rusty finds what he needs to compel the officers to act quickly--clear evidence of a meth lab inside the ramshackle house and a new, obviously mistreated watchdog chained in the yard. Then, when Rusty persuades his mother to drive by the house to show her why he had to take the dog, the dog's owner spots Rusty in the car, notes the license plate number, and later follows them to their house with threats of violent retribution. 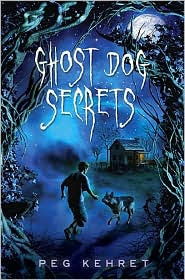 Peg Kehret's latest adventure novel for middle readers, Ghost Dog Secrets (Dutton, 2010) is more than just a page-turner of a ghost story, although it is indeed that. Her story, filled with realistically drawn characters, deals with several moral dilemmas--keeping secrets from parents, breaking family rules to save an abused animal's life, and the big question of whether removing such an animal is stealing or a brave act of mercy. The story is fast paced, and despite the element of fantasy, comes to a credible and suspenseful climax with the police at last on Rusty's side. Rusty is a believable and likable main character, and the element of fantasy is handled within the bounds of good storytelling in this latest novel from the award-winning Kehret. Peg Kehret is also the noted author of many middle reader thrillers, including Stolen Children, Escaping the Giant Wave, and Abduction!